Construction on the skate park expansion could start as early as next month. The Crook County Parks and Recreation District Board will award the bid to complete the project to a contractor at its April 10 meeting, and after signing the contract for the work, could break ground at any time. "If they get right on it, they could start as soon as May," said Duane Garner, the parks district's executive director. The skate park expansion will double the footprint of the existing attraction, and all of the metal ramps will be replaced in favor of concrete ones. The plaza-style park will be built primarily above ground and feature ramps, steps and a railing, Garner said. The low water table, due to the park's proximity to Ochoco Creek, will prevent the inclusion of many in-ground features, although the design calls for a shallow bowl. The skate park was designed by Dreamland Skateparks with the help of about 60 local kids who weighed in during public sessions regarding what they would like the expanded park to feature. The project is expected to cost about $430,000, according to a recent engineer's estimate, and much of that funding will come courtesy of a local government grant awarded by the State of Oregon. "It will provide 60 percent of the funding," Garner said, "and 40 percent is coming from the district." The deadline to complete construction of the expansion was set at Aug. 30. Whether or not the project will be completed sooner than that depends on how the weather behaves and the schedule of whichever contractor is chosen for the job. "I tried to create a large enough window to provide a little bit of flexibility," Garner explained. The skate park will be closed during the construction process, enabling workers to remove all of the existing ramps and add new ones. "Likely, it will be fenced off," Garner remarked. The skate park expansion is one of three projects planned for the area. The parks district is also planning to resurface the adjacent tennis courts and convert them for pickleball play, and diagonal parking spaces will be added along the Juniper Street property frontage. "It is being done in different pieces primarily because skate park contractors are very specific in scope," Garner said. "There are companies that just build skate parks, and they travel all over the world doing it. It's their specialty." The skate park was also chosen as the first project because it is the most expensive, and the money spent on it will determine how much is left over for the other two projects. If there is enough money to move forward with the tennis court project, Garner would like to pursue it next or possibly move ahead with the courts and the parking at the same time. Garner is excited to finally see the skate park project break ground. 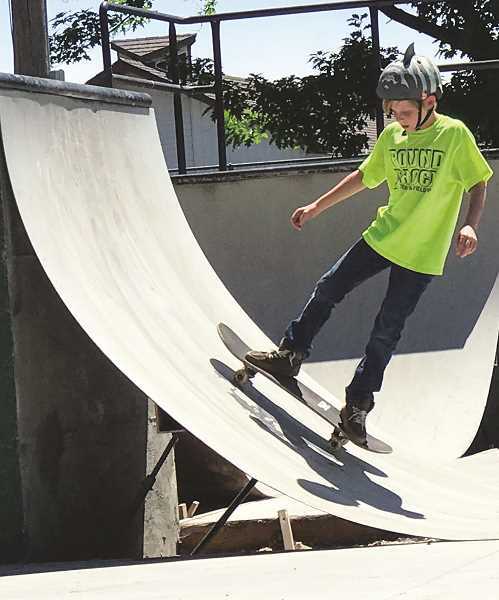 He pointed out that plans first began on the skate park expansion several years ago and it is hard to believe the time has finally come to get started. "Kids have been waiting a long time for this," he said.